In one of the village have five different schools. The number of boys in school A is one-eighth of the total students. The number of boys in school B is 10% of the total students in all the five schools together. The ratio between the numbers of girls to boys in school E is 1:1. The number of boys in school A is equal to the sum of number of boys in school B and the number of boys in school E. The number of girls in school C is 20% of the total number of girls. The number of boys in school C is three-two of the number of boys in school B. The number of students in school A is 50% more than the number of students in school D. The number of students in school B is 15% of the total students. The total boy in all the five schools together is 200 less than the total number of girls in all the five schools together. The total number of students in all the five schools together is 1200. 1. What is the difference between the total number students in which school has the highest number of girls and the total number of students in which school has the highest number of boys? 2. From a group of number of boys in school D and the number of girls in school E, two students are selected at random. Find the probability that at least one girl is selected? What is the ratio of girls to boys in School F? Statement I: Total number of boys in School F is 200% of the number of students in School E.
Statement II: Total number of girls in School F is 130 less than the total number of students in School F.
So, both statement I and II are also not sufficient to the answer the question. Quantity I: What is the average number of boys in school A, E, C together? Quantity II: What is the average number of girls in School B and D together? Quantity I: What is the difference between the total number of students in School A and B? Quantity II: What is the difference between the total number of students in School D and E? 6. I. 8, 4, 6, 15, 52.5 II. 12 …. 78.75. If 78.75 is the nth term, then find the value of n? II. 46 ….. 9808. If 9808 is the nth term, then find the value of n? II. 2.5 ….. 135712. If 135712 is the nth term, then find the value of n? II. 4 …… 217632. If 217632 is the nth term, then what value should come in the place of (n-1)th term? II. 961 ….. 1717. If 1717 is nth term, then what value should come in the place of (n - 2)th term? 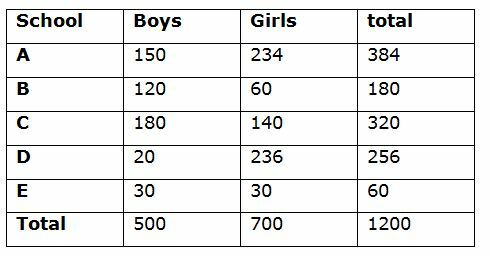 1) What is the difference between the total number students in which school has the highest number of girls and the total number of students in which school has the highest number of boys? 2) From a group of number of boys in school D and the number of girls in school E, two students are selected at random. Find the probability that at least one girl is selected? 3) What is the ratio of girls to boys in School F? 4) Quantity I: What is the average number of boys in school A, E, C together? 5) Quantity I: What is the difference between the total number of students in School A and B? II. 12 …. 78.75. If 78.75 is the nth term, then find the value of n? II. 961 ….. 1717. If 1717 is nth term, then what value should come in the place of (n – 2)th term?